In accordance with the requirements set out in the Renewable Energy Directive, a 2017 report has been compiled detailing a comprehensive overview of renewable energy deployment in the EU. 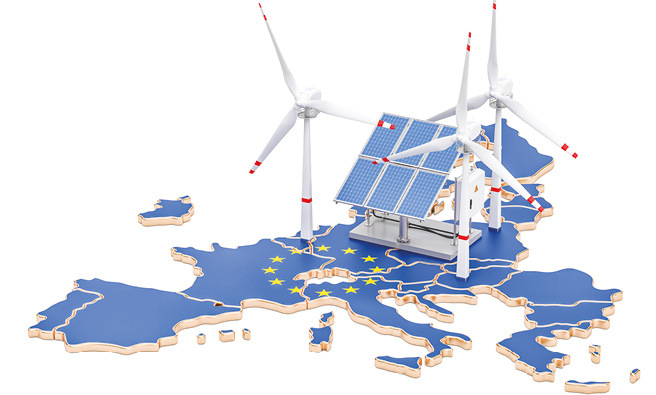 The submission of national reports and other available data updating the EU on progress towards the overall 2020 renewable energy goals, collected every two years, has provided an overview of renewable energy policy developments across EU countries. The 2017 report, based on the 2015 national reports, shows that while the EU’s share of renewable energy sources (RES) is above the indicative trajectory to date, steeper targets in the years to 2020 will require an intensifying of efforts. The 2015 RES of 16.4 per cent, is above the 13.8 per cent indicative trajectory of 2015/16 and above the 2014 total of 16 per cent. Heating and cooling remains the largest sector in terms of absolute renewable energy deployment but the largest growth is evident in the electricity sector where RES grew by 1.4 per cent per year between 2004 and 2014. Growth was slowest in the transport sector, at just 0.5 per cent per year. Solid biomass continues to remain the largest contributor of renewable heat production (82 per cent) but both production from heat pumps and deployment of renewable waste have shown better results than their indicative trajectory. Production from heat pumps, in which Italy leads in deployment, was 9.7 million tonnes of oil equivalent (mtoe) compared to the trajectory of 7.3. The report states that while the EU market of heat pumps has been slowing down since 2013, it has potential to increase in the coming years. Renewable waste deployment, largely biogas, was negligible in 2004 but by 2015 it had increased from 0.7 mtoe to 3.4 mtoe. Solar thermal heat production, which was 2 mtoe in 2015 fell short of the National Renewable Energy Action Plan’s (NREAP) 3 mtoe projection. Increased competition from other renewable technologies has been put forward as an explanation for a fall in annual capacity installation numbers below the 2006 level. Geothermal deployment is also below the anticipated trajectory, with just 0.7 mtoe in 2015. Italy, France and Hungary are leading the way in terms of deployment but the high level of capital expenditure associated with the method has meant uptake is slow. The 28.3 per cent from renewable energy sources recorded across the EU in 2015 is significantly higher than the NREAP trajectory for renewable shares in electricity. Hydropower still dominates the largest share of renewable electricity but has declined to 38 per cent in 2015 from 74 per cent in 2004. Sweden, France, Italy Austria and Spain have about 70 per cent of all hydropower in the EU. Wind power has more than quadrupled over the same time span and accounts for about a third of renewable electricity. Germany and Spain have been the largest contributors to onshore wind deployment, which is in line with its trajectory. However, while Sweden, Germany, the UK and Denmark appear to be above the offshore projection, at EU level progress is 12 per cent below the NREAP trajectory. This is expected to improve as costs decrease and grid connections become easier. Solar PV showed a dramatic increase and accounted for 12 per cent of all renewable electricity in 2015 driven by technology, cost reductions and quicker project development times. Electricity generated from biomass also grew to 13 mtoe in 2015, however this was short of the target. The transport sector is below the NREAP trajectories at EU level, with a 6 per cent share of renewable energy in 2015, compared to the 10 per cent target. Renewable energy in the sector is dominated by biofuels (88 per cent) with limited input from electricity. Biodiesel represents 79 per cent of total use of biofuels in 2015 but failed to reach the level in NREAPs in 2015 (10.9 mtoe instead of 14.4 mtoe). The second largest contributor, bioethanol, was also under deployed (2.6 mtoe instead of 4.9 mtoe). Renewable electricity usage was 13 per cent lower than expected and while the use of other renewable energy sources such as biogas are being utilised in Sweden and Finland, they are not significant enough to be measured. One positive amongst the transport sector has been the increase of biofuels produced from wastes, residues, ligno-cellulosic and non-food cellulosic material from 1 per cent in 2009 to 23 per cent in 2015. While the vast majority of member states are on track in terms of renewable deployment, the 2017 report highlights need for most to reach the 2020 binding targets. France, Luxembourg and the Netherlands in particular are recommended to substantially increase their shares in 2016 to keep on track with their respective trajectories. The EU as a whole should reach its 20 per cent target by 2020 but some member states such as Ireland, Luxembourg, the Netherlands and the UK “might have to reinforce cooperation with other member states by using cooperation mechanisms such as statistical transfers to timely reach their national binding targets”.